"3LA1, V-1991" by Timothy K. Perttula and Robert Z. Selden Jr. CONTEXT INFORMATION: From a grave (Burial 1) in Burial Plot 2 (Martin 1939). Associated vessels in this grave include V-1987 to V-1990 and V-1992 to V-1994. DECORATION: There are single rows of punctations on this jar, one below the lip and the second immediately below the rim-body juncture. 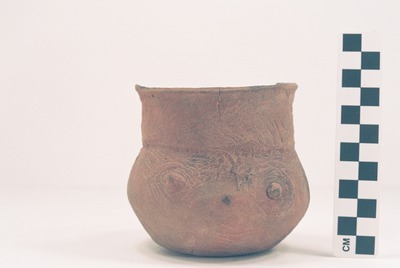 The body has four panels with incised concentric circles and hatched lines, with the central element in the body decoration being an appliqued node. Only one of the concentric incised circle panels is set apart from the others by a series of five vertical incised lines. Foster Trailed-Incised, var. unspecified jar (5425-640).